"Sampath Speaking" - the thoughts of an Insurer from Thiruvallikkeni: Will Catalan President Carles Puigdemont announce independence ! - delays speech !! Will Catalan President Carles Puigdemont announce independence ! - delays speech !! I first read about this place, when bullfighting was banned in the Spanish autonomous community by a vote of the Parliament in July 2010. The ban came into effect effective Jan 2012. The last bullfight in the region took place in Barcelona in September 2011. The ban, which ended a centuries-old tradition in the region, was supported by animal rights activists but opposed by some, who saw it as motivated by political nationalism rather than animal welfare. Catalonia is an autonomous community of Spain located on the eastern extremity of the Iberian Peninsula. It is designated as a nationality by its Statute of Autonomy. Catalonia consists of four provinces: Barcelona, Girona, Lleida, and Tarragona. The capital and largest city is Barcelona, the second-most populated municipality in Spain and the core of the seventh most populous urban area in the European Union. Reports presently on web suggest that the Catalan president, Carles Puigdemont, has delayed his crunch speech at which he may announce the region's independence by one hour. In extraordinary scenes, neither the Catalan leader nor his MPs appeared in the debating chamber, leaving the opposition politicians sitting in confusion for several minutes before they filed out, looking exasperated. The theatrical development raises the tensions even further after a fraught 10 days since the Catalan referendum. Delaying a major speech is highly unusual in the regional parliament and adds to the sense that today's events are wholly unprecedented. It is understood that the decision to delay the speech was taken by the president himself. It was initially thought Puigdemont had delayed his key speech because he was locked in talks with international mediators who are desperately trying to avert a huge constitutional crisis. But AFP reported that the Spanish government rejected mediation with Puigdemont. 'It's not on the cards,' a central government spokesman told the agency. It is also understood that MPs from CUP, a radical pro-independence party, objected to the text of the president’s speech because it did not go far enough. The draft text did not even mention independence explicitly, Spanish media said, and this contributed to the delay. The stalled speech risks making the Catalan leader look weak in the international spotlight. Reports further add that Spanish police are ready to arrest Catalan President Carles Puigdemont immediately if he declares independence in the regional parliament, according to two people familiar with the government’s plans. While a final decision on whether to act has not yet been taken, Spain’s National Police force has elite officers deployed in Catalonia who are prepared to join a raid if Catalan police try to shield Mr Puigdemont, said one of the people. If Mr Puigdemont makes a statement that falls short of immediate independence, the government in Madrid may stay its hand. The President is likely to use the words “declaration of independence,” but they will probably be qualified or hedged in some way, according to another person familiar with his plans. Tensions are running so high ~ that even dogs are not spared. 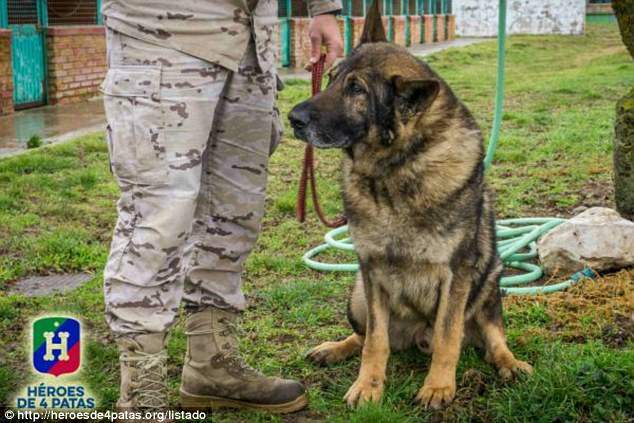 Daily Mail UK reports that two retired police dogs were banned from an animal charity event in Catalonia because they worked for the Spanish police force. The pets and their new owners were due to appear at the event to encourage adoption of such dogs, but their invitation was rescinded once it emerged that they had been part of the national police's canine units. The adoption agency has now slammed the organisers, voicing their dismay at the dogs being banned because they worked for the Spanish - not the Catalan - police. 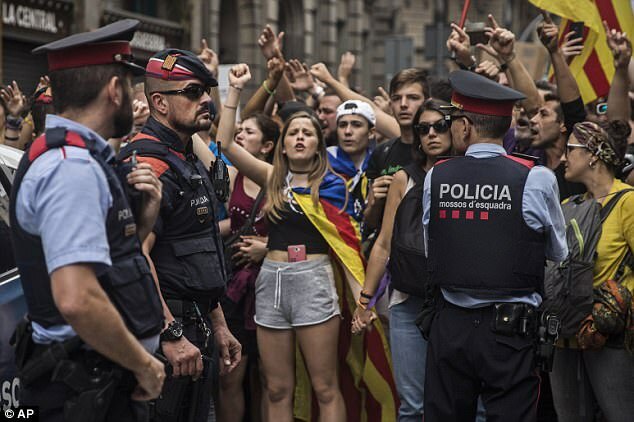 Catalan aversion towards the national police is at an all-time high, following the extreme violence carried out by Spanish forces during the independence referendum last Sunday. Catalonia has it's own police force - Mossos d'Esquadra - but as the Spanish government had ruled the referendum illegal, dozens of national police officers were drafted in. Some 900 people were injured on polling day when police fired rubber bullets and charged at crowds with truncheons to disrupt the vote. That is pretention ~ perhaps if not dogs, many many people know and know what they exactly are demanding !! 10th Oct 2017 @ 22.30 hrs.